A statement from the spokeswoman said he was surrounded by his three children when he died in Arlington. “The Chief Justice battled thyroid cancer since being diagnosed last October and continued to perform his dues on the court until a precipitous decline in his health the last couple of days,” she said. Rehnquist was appointed to the Supreme Court as an associate justice in 1971 by President Nixon and took his seat on Jan. 7, 1982. He was elevated to chief justice by President Reagan in 1986. Justice Rehnquist battled thyroid cancer since being diagnosed last October. 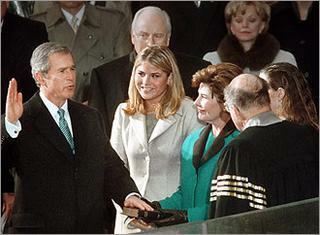 He rallied from his illness to preside over the inauguration of George W. Bush in January. His death ends a remarkable 33-year Supreme Court career during which Rehnquist oversaw the court’s conservative shift. 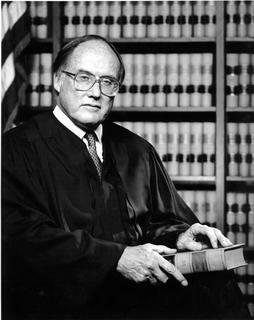 Rehnquist attended law school at Stanford and graduated first in his class. Justice O’Conner finished third in that same class. The two dated briefly while in school at Stanford. Justice O’Conner retired from the Supreme Court earlier this summer. Judge John Roberts was picked by President Bush this summer to replace Justice O’Conner. Update: Betsy’s Page has a wonderful tribute to Chief Justice Rehnquist, via Powerline.